The project at Montrose to lower the elevated freeway into a new trench is nearing completion. The trench is now fully excated and paving will begin soon. 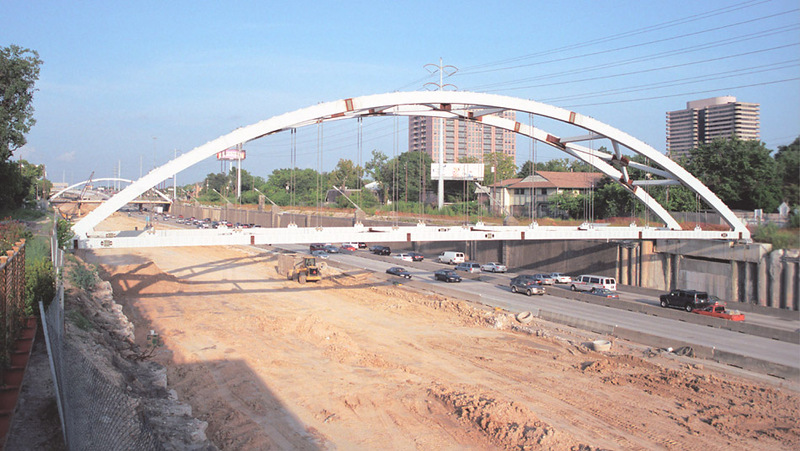 The new arched bridges at Graustark and Montrose are in place and work is proceeding to build the decks. 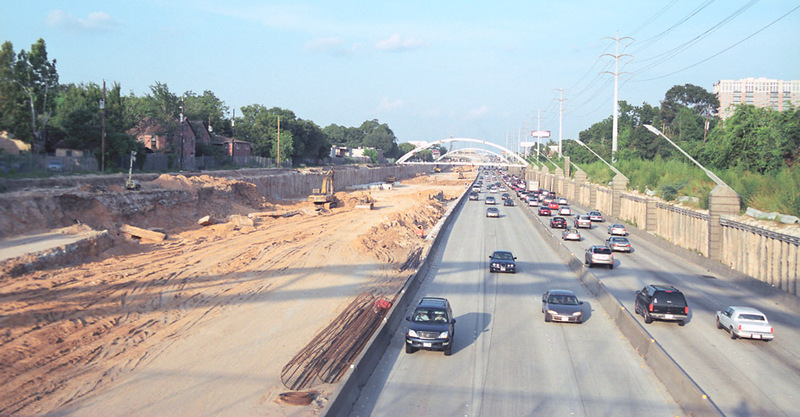 This view looks east from the Mandell overpass, showing that the trench is just about completely excavated. 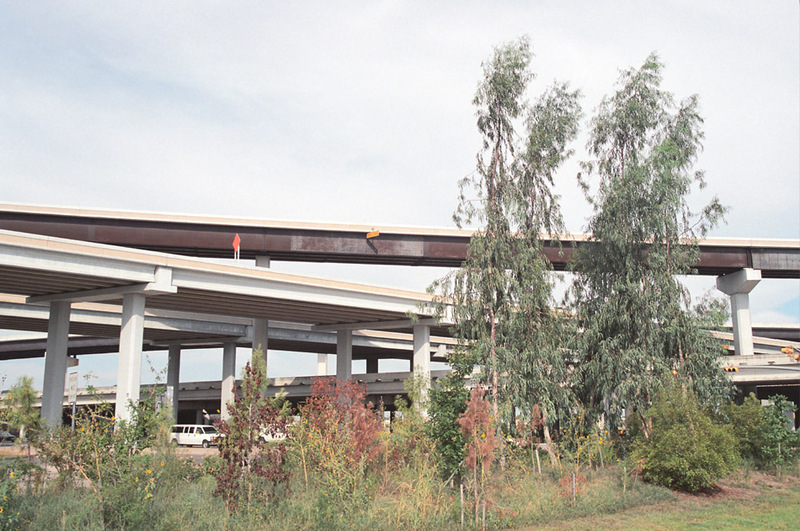 This view looks east from the Mandell overpass, showing the traffic lanes on the future northbound side of the freeway. This view shows the arch for the bridge at Graustark. 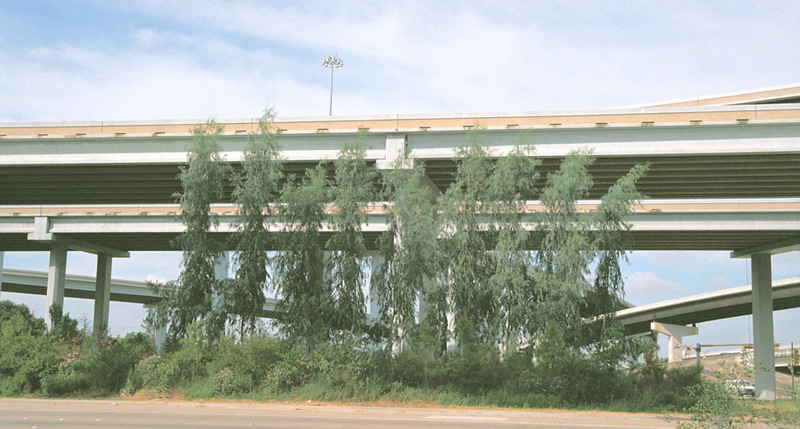 This view shows the split at Spur 527, looking east from the Montrose overpass. The guy [at the nursery] was pretty up front about them. I think there is only one nursery that sells them. They are calling it a Galveston Eucalyptus. The drawbacks about them are that the bark and leaves they shed have no biological enemies therefore the leaves and bark need to be raked. TxDOT was looking for "plant and forget"-type trees so I think the Eucalyptus may be up in the air for future plantings. Other drawbacks that the nursery guy said was the fire risk [due to oily leaves] and that the trees produce a small fruit in the summer which could possibly stick on bird's beaks. He said you also don't want to plant one right next to the foundation of your house. He touched on the invasive aspect too and said that all the trees he sells are sterile. They are really cool looking trees though and fast growing." Here is another view of the Galveston Eucalyptus. 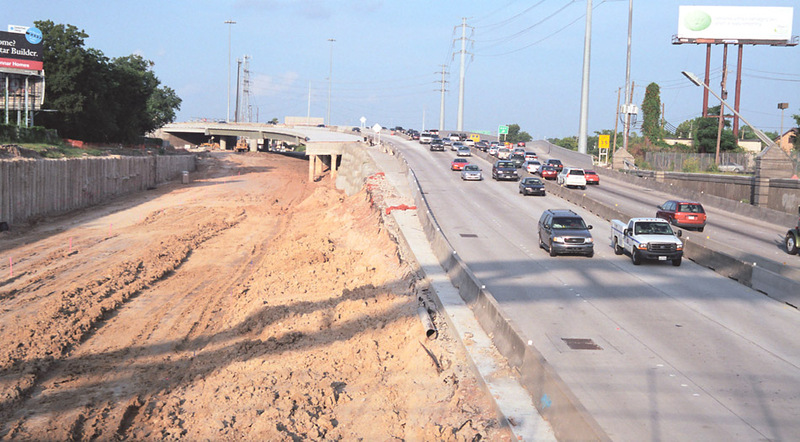 This view looks northeast (US 59 northbound) from University Boulevard, showing embankment buildup. 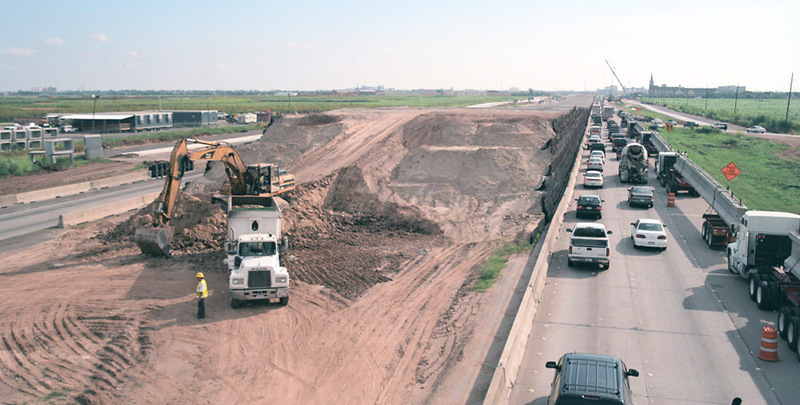 The existing 4-lane freeway is being upgraded to 8 lanes from SH 6 to the Grand Parkway. 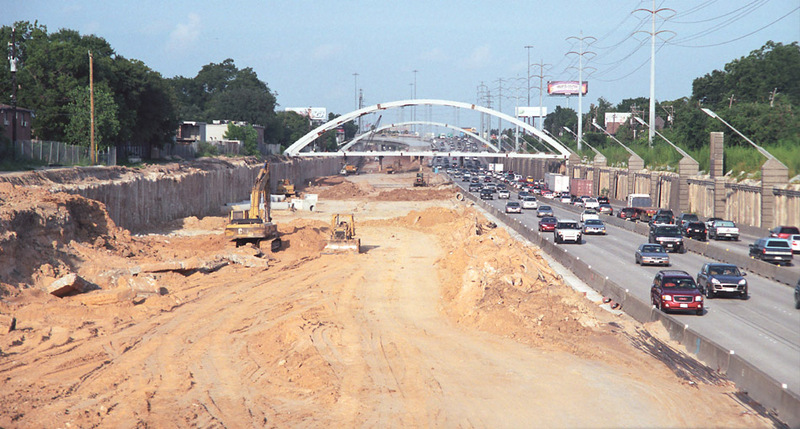 This wider view looking northeast shows a convoy of precast bridge piers parked along the freeway, awaiting delivery to a freeway construction zone in Houston. This view looks southwest (US 59 southbound) at University Boulevard in Sugar Land. 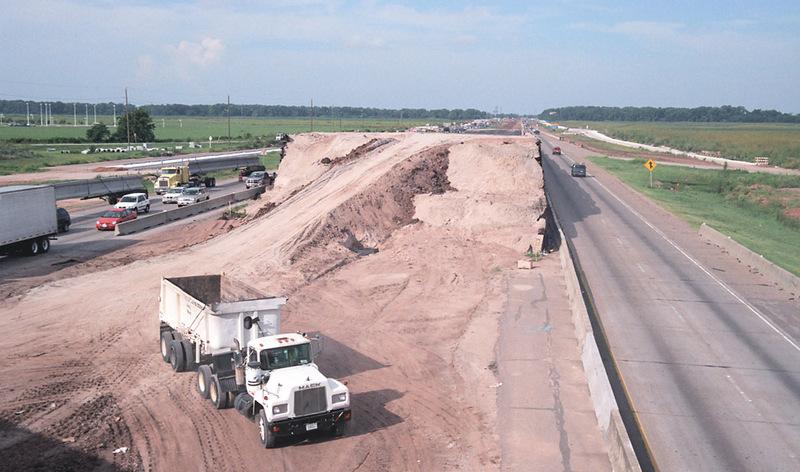 Embankment is being built up for the new US 59 overpass, which will replace the existing University overpass. This is a wider view looking southwest at University. The new frontage road can be seen on the right.